With fewer enzymes, you also cannot fight viral or bacterial or fungal infection. Now, you can't digest, absorb, build protein, use muscles, or excrete poison. With metal, your body can't make enzymes. Just like a car engine has the piston at its core, an enzyme has a mineral at its core. Your body can't tell the difference between a mineral and it's close cousin, the heavy metal. Any enzyme built around a heavy metal is broken. Every single organ system can become affected, directly or indirectly. Different heavy metals affect different enzymes, debilitating different organs, causing different symptoms. Build up of broken down waste changes the pH, temperature, and blood flow to organs. Chronic disease and auto-immune disease are the result. Autoimmune diseases arise from an inappropriate immune response of the body against substances and tissues normally present in the body. In other words, the immune system mistakes some part of the body as a pathogen and attacks its own cells. This may be restricted to certain organs (e.g. in autoimmune thyroiditis) or involve a particular tissue in different places (e.g. Goodpasture's disease which may affect the basement membrane in both the lung and the kidney). The treatment of autoimmune diseases is typically with immuno-suppression—medication which decreases the immune response. In the context of biology, a "poison" is any substance that can cause disturbances to life forms, by chemical reaction or by other activity on the molecular level, when a sufficient quantity is absorbed through epithelial linings such as the skin or gut. In medicine (particularly veterinary) and in zoology, a poison is often distinguished from a toxin and a venom. "Toxins" are poisons which are produced by living things, and "venoms" are usually defined as toxins that are injected by a bite or sting of an animal to cause their effect. 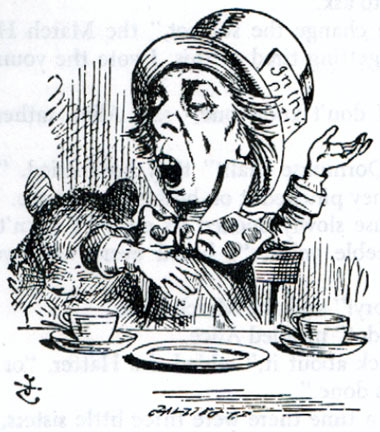 **Alice in Wonderland's "Mad Hatter," above, was a caricature of the hat makers of the day who were exposed to mercury vapors in their industry, leading to BRAIN nerve disease, psychosis, and premature death. Recorded on July 12, 2006. Klinghardt sites papers about bodies purposely maintaining and feeding fungal cultures in order to absorb the heavy metals it cannot rid itself of. POISON ? vs. TOXIN ? antibiotics may also "pick up and drop" the heavier elements, moving these poisons around in your body.